Another ink from January ink drop. Dry time on this ink varies a lot. It dries very quickly on cheap paper (less than 5s) but it takes more than 20s on Maruman Mnemosync paper. Thus, this makes it a great ink to use on standard office supplies. The flow was quite good and smooth. The blue is qute dark on cheap paer but on expensive paper there is some shading. The colour is quite saturated and dark. 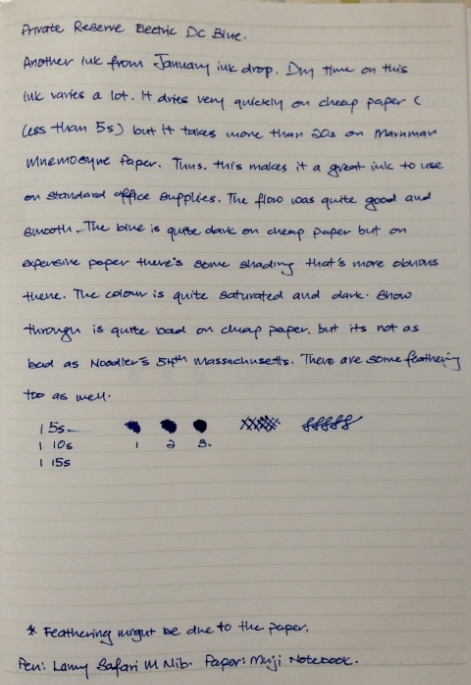 Show through is quite bad on cheap paper but it is not as bad as Noodler's 54th Massachusetts. There are some feathering too but it might have to do with my paper.